A vibrant business has many marketing channels, on and offline. Colour Graphics show how to utilise offline marketing to attract more business and custom, without a heavy price tag. Accustomed to social media marketing and exposure, many businesses wrongly assume that offline marketing is cumbersome and lumbering, producing few if any results. But offline marketing can and do still yield results. What is important is what these tools are and how they are used. #1 The business card – scatter far and wide. You can’t leave an e-business card scattered about in various locations can you? But with a printed business card you can. Having written extensively on business cards and distribution strategy, Colour Graphics understand that even in today’s digital world, the small rectangular piece of printed card still pulls a punch. 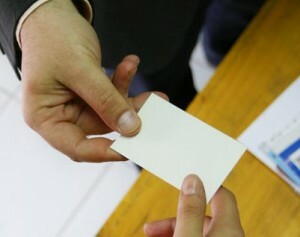 Always have your business cards on you and no matter where you are, you have a card or two to leave lying around. Postcards can yield similar results too. #2 Be active in trade shows, events and other networking activities. We live in an ever-changing world but that doesn’t make past marketing activities defunct. Some ‘old-fashioned’ marketing ploys and tactics are not broken, such as the networking with potential trade partners. And then there are trade shows, perfect for launching new products or reminding people of the great set of services you offer. But like most marketing opportunities, if they are planned, the more your business will get from them. #3 Work on your reputation as an influencer and thought leader. This takes a little more effort but placing yourself or your business as the experts in your field is one thing but being able to set a trail for others to follow is another. Not strictly offline in the sense of printed material, placing your company as the business to follow and to look to for the latest innovations and thoughts of your industry is worthwhile. Just as there are online influencers, you can be an offline influencer too. So how about offering free consultation days or sharing workshops at your business premises. These can be a double-edged sword with both sides of the argument of whether this is a good idea or not making sense. On one hand, this can be an expensive route to take. Some printed products can be expensive and if you are a small business or start-up, it can prove a costly means of extending your marketing reach. However, there is a school of thought that suggests the return on investment of giving away freebies is not something that happens immediately but the warmth of receiving a gift or something for free is a positive one and one that stays with a person for some time. And if they need a service or product you offer, they are more likely to remember who you are and what you do. There are pros and cons to giving away branded products. Driven by a distribution strategy to ensure success, there are many products that cost pence to produce and print with your logo and contact details. … or even national media outlets. When there is a crisis, a problem or something good happening, journalists always love to have a go-to person they can tap for a quote on the subject or situation. Just like you can influence online and other businesses, establish yourself as an authority with the media too. This gives you invaluable coverage and with so many media outlets these days, from printed newspapers to online news portals, this isn’t hard to do. Start with an email to a local press office the next time there is a new story that relates to your business or industry. #6 Build a company archive. Images are a powerful marketing tool as is the history behind your company. Time flies by and so you may think your business is young compared to others but photos from company or corporate events from the 1980s will be ‘historic’ to some. Just like we snap selfies and photos of family and our children’s milestones, do the same for your business too. From holding an event today to sharing photos and advertising campaigns of the past, you can retain an interest in your company. Offline marketing needn’t be complicated. Neither does it need to be expensive. The simplest of offline marketing tools can yield results. Colour Graphics is an established online design and print agency with over two decades of experience. Follow them on twitter @ColourGraphics.